"I could announce one morning that the world was going to blow up in three hours and people would be calling in about my hair! " My hair naturally has a lot of wave to and some serious ringlets in the front. It looks crazy unless I blow dry and style it. However all that hear styling is bad for my hair and it takes up a lot of time. So recently I have been branching out trying to find news ways to style my hair without heat and without a lot of time. The first thing I tried was Velcro rollers first. This was a compromise because I did still have to blow dry my hair, I could cut out all the heat styling though. 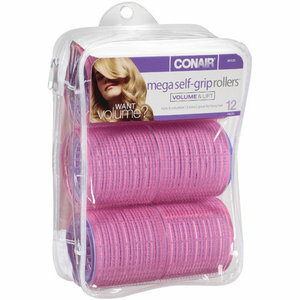 I bought these really big pink ones, thinking I would set my hair with bobby pins and then sleep on them. Wow yea baaaaad idea. The curlers were way to big and my head hurt all night long. I woke up and took out the curlers and my hair was this limp kinked up mess. Now I used these same curlers since them to put body on my crown when I am blow drying my hair and that works fabulously... sleeping on them and then expecting curls does not. Next I tried a throw back to my childhood. When I was little my mother loved to put my hair in sponge rollers and sleep on them and it would make cute ringlets. SO I went out and tried to find some. I was very excited to find them in a wide variety of sizes. The ones I used to wear were small about half and inch but the ones I ended up purchasing were bigger about an inch. The also sell them in a bigger size, about one and half to two inches and I might try these next. The first time I attempted my sponge rollers was a DISASTER. I put them in wet hair just like I used to when I was little... well apparently I have much more hair now. The rollers in the back didnt try so the hair was the horrible damp limp stands and then the ones on top I apparently rolled to tight so the ends were a;; crazy and kinked and basically it looked a hot mess. Stubborn as I am I tried this business again to much better results. I blow dryed my hair first and then rolled bigger sections in the rollers, about an inch to two inch sections. I slept on them and when I woke up I did have pretty good uniform curls. However I did make an error. Really I should know better. When I put the rollers in I put them in horizontally so when he curls came down instead of pretty cascading curls that went away from my face I got these weird shaped corkscrew shaped curls that were just not cute. However the volume way amazing and the style stayed all day long without much hairspray. Try, try, try again. I have every intention of mastering the sponge curlers and when I do I will post pictures and a tutorial. Lets all keep out fingers crossed that practice makes perfect!